The Iowa Lottery says retailers passed the test when it comes to paying out the proper amounts in prizes, but only half passed the test when it comes to doing the paperwork. Iowa Lottery spokesperson Mary Neubauer says lottery fraud in Canada and California prompted them to make unannounced security checks to retailers across the state. Neubauer says there doesn’t appear to be any problems in Iowa, but they felt they should do checks to be sure. Lottery security officials posing as customers check 126 retailers last month. She says the security officials presented retailers with a winning tickets that ranged up to $100. Neubauer says in every instance the retailers paid the exact amount the person should have been paid. 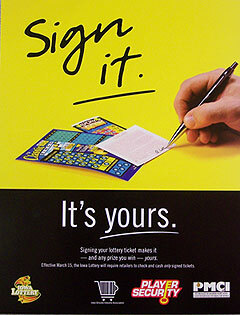 The lottery last year began requiring a signature for someone to check if a ticket is a winner or to cash in a winning ticket. Neubauer says the retailer compliance for that requirement was not good. She says about half the locations did not require a signature and so the Iowa Lottery will go back to those locations and explain why the signature is a requirement and why they are doing it. Neubauer says they hope to get retailers to comply with the signature requirement before taking any action against them. Neubauer says they do have a process where retailers can be given a warning and if there are repeated violations, they can suspend the retailers license. She says they believe they can take care of the situation with some retraining. Neubauer says it’s also important for the public to realize that requiring a signature is done to protect players from any type of fraud. Neubauer says anyone who has a concern about the lottery, its products or operations can contact the lottery at 515-725-7900.